Shadecloth can be used to control the amount of light and wind allowed under your pergola. What is pergola shadecloth made from? Most shade cloth is made from polypropelene monofilament strands, combined together into a yarn which is then used to weave a fabric. Shade cloth can come in a variety of different tints to suit any outdoor environment, and it is UV protected to prevent fading from sun exposure. The loose weave of the fabric won’t prevent rain from coming through, but makes for an effective way to block out a bit of light and wind. Shadecloth is not the same thing as a shade sail, which is solidly woven and usually made from PVC or canvas. 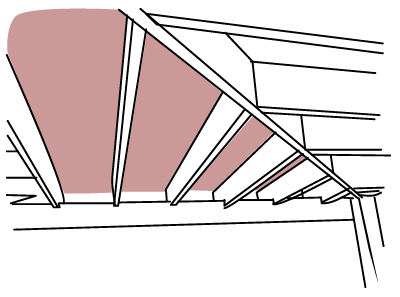 Shadecloth is usually affixed to the battens on the roof of a pergola or gazebo to create a shady area underneath. It can also be stretched around the sides of a pergola to provide even more shade from morning or afternoon sun, or to partially block out the wind. It is particularly useful in areas where tropical plants are growing, as these generally prefer a little more shade and can quickly dry out with too much sun exposure. Shade cloth is typically attached to the wooden battens of your pergola with rectangular plates hammered in at regular spacings. The advantage of using plates over nails is that the tension point is spread around the whole edge of the plate, rather than fixing on a single point as with a nail. This can help reduce tearing when conditions are very windy and the cloth is under a lot of strain. Other methods of affixing the cloth include clip on pins, butterfly clips and lacing cords. Shade cloth is available in a wide range of colours to match your outdoor décor and the level of light you desire. Common colours include black and green, though beige and red shade cloth can make a striking difference to the appearance of your backyard and the light quality under your pergola.